Woman from Kabul is a work about living in Afghanistan at the turn of the new millennium. The artist recalls a country rich in history and resources that has collapsed under the weight of war. 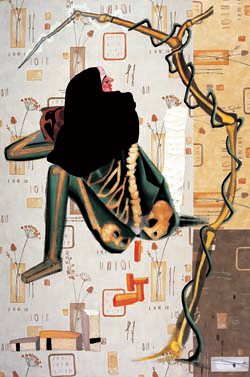 A figure of an elderly woman, stripped of most of her black burka, squats over a very decorative backdrop of wall paper. Her body is revealed as skin and bones, representative of the oppression and squalor that has become endemic of the city. Dodiya’s work is a potent reminder of the plight of the refugee. Through his paintings and assemblages, Atul Dodiya engages with both political and art history in a way that entwines global /public memory and local/personal experience. In his most recent series of paintings Dodiya appropriates the images and styles of famous artworks. By doing this he pays homage to his influences, but also ‘borrows’ their identities through a kind of painting role-play: copying becomes a form of ‘channelling’ or re-enactment, weaving the master’s identities and ideas to Dodiya’s own (and vice versa). Fool’s House is a tribute to Jasper Johns, the American pop artist renowned for painting generic graphic motifs such as targets, maps and text fonts. The fragmented composition of this painting – divided into rectangular shapes – references the design typical of Johns; the segments of the canvas contain quotes of a Johns map and target. Dodiya first came to prominence with his paintings done on roll down security shutters, and in this work he imprints his own history upon his hero’s, re-conceiving Johns’s international abstraction as a local shop front. The ‘taped photographs’ in the scene make reference to Johns’s 1984 painting Racing Thoughts which used this device to quip famous artworks such as the Mona Lisa; in Fool’s House, one of Dodiya’s snap shots contains an image of Manray’s Cadeau, emphasising his painting as an offering or gift. In Portrait of Niko Pirosmani (1862-1918) Dodiya portrays the Georgian primitivist Niko Pirosmani, who was revered for having invented a new technique of painting during periods of solitude and poverty. The portrait of Pirosmani initially formed part of Dodiya’s large scale exhibition ’Shri Khakhar Prasanna’ which was dedicated to his friend, the late painter Bhupen Khakhar. 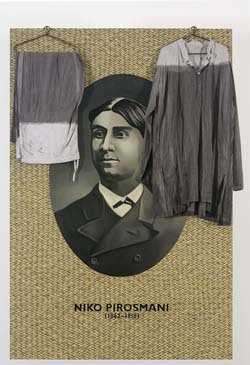 Believing that Khakhar was influenced by Pirosmani, Dodiya wanted to include the Georgian painter in his show. 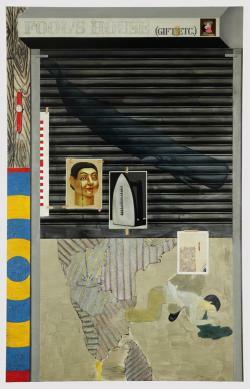 The artist uses found objects such as the cotton Kurta and pyjamas which hang over this painting. Here they are dyed a different colour in tribute to Khakhar, who dyed his kurta pyjamas black so he could wear them as an apron in his studio. Atul Dodiya is one of the finest artists to emerge in modern times. His works have been exhibited all over the world, including Madrid and New York. Collections of his works are with the Anand Bazar Patrika Group, The Times of India group, RPG Enterprises and Gallery Chemould. As a young boy whose family came from Saurashtra, Gandhi was an intimate part of my boyhood. While in school, I read his autobiography in the original Gujarati and was awed by his passion for truth and nonviolence, his clarity and his patriotism. I used to draw Gandhi quite often as a kid. Every two years, I create an image of Gandhi. So you could say that Gandhi is a recurring theme for me. The series evolved because during the celebration of our 50th year of Independence, I was asked to create a commemorative piece. For me one of the most significant and disturbing images of the 50 years was the breaking of the Babri Masjid and the subsequent riots and bomb blasts in Bombay, where 22 boys from Ghatkopar had died. I called my piece Lamentation. It was a large painting divided into two parts. The first showed an image of Gandhi with his back to us, walking along a railway station with his hand on a young boy's shoulder. I juxtaposed it with a Picasso painting with a little girl with wild Kali-like eyes. All around were lamenting angels, in the manner of Giotto's painting lamenting the death of Christ. What I was trying to say was that with Gandhi gone, little girls like my own daughter had no option but to become avenging goddesses like Kali. Mumbai, Feb 22 (IANS) The Saffronart spring online auction of modern Indian art works will take place March 12-13 and feature 140 works by 55 artists. Paintings of Surendran Nair and Atul Dodiya will be the highlights. The auction includes works of the younger lot of artists who have tasted success much earlier than their elders. Top of the sale is lot 72 - Nair's "Doctrine of the Forest: An Actor at Play"(Cuckoonebulopolis), an oil on canvas estimated at $144,740-171,060. This is the icon for the Saffronart sale that promises a host of great works and frenzied bidding. In this work, the artist depicts a traditionally masked and lungi-clad Kathakali actor from Kerala, seemingly deep in meditation, perhaps getting into character for a performance. However, the gravity of the subject's elaborate make-up, vestments and yogic pose are compromised by Nair's placement of a bright yellow rubber-ducky peering up at him from his feet. Nair, who lives in Ahmedabad, is an ardent observer and commentator on identity and socio-political change. He draws his images from the abundant global archive of historical, religious, mythological, literary, political and artistic facts, practices and traditions that he maintains. The artist's provocative canvases link previously unrelated elements from these annals to push the limits of his viewers' notions of identity, community and reality. Equally enticing is Nair's "Darwaja Kholo"on paper - a watercolour of a sari-clad beauty with a deer sitting at her feet. It is estimated at $52,640-65,790. Subodh Gupta's "Let Me Make My Damn Art"is estimated at $60,000-70,000. Marrying the worlds of high art and B-grade cinema, Gupta also uses this piece to comment on the violence inherent to his creative process. It seems that the cause of the armed dispute in the piece, unlike the movie it is based on, is an interruption of the artist's work. His second work is the stainless steel sculpture "Feast for a Hundred God"estimated at $70,000-90,000. To reflect India's unique growth and to voice his concerns about the new and undefined interstitial spaces that have come to exist between modernity and tradition, city and country, Gupta has chosen one of India's most commonest commodities as his medium: the shiny stainless-steel kitchenware that is a familiar sight in homes and stores across the country.